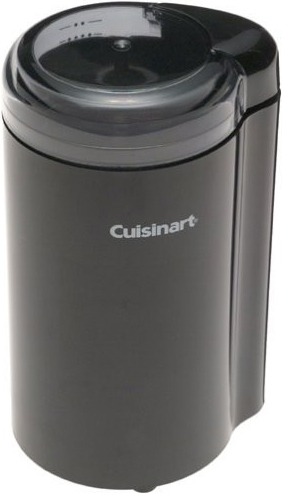 The Cuisinart DCG-20Ncoffee grinder features a white/black housing, and removable stainless bowl and blade assembly. This big, sleek coffee grinder can handle 70 grams of beans at once, and it grinds spices as well. It features a stainless steel grinding bowl that holds 70 grams of whole beans, enough for 12 cups of coffee. A single on/off button controls grind consistency, and a built-in safety interlock makes the grinding safe and easy. The Cuisinart Coffe Grinder Black Nic has many exciting features for users of all types. 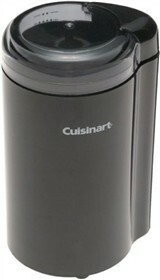 See the Cuisinart Coffe Grinder Black Nic gallery images above for more product views. The Cuisinart Coffe Grinder Black Nic is sold as a Brand New Unopened Item.